Need costume ideas? Check out Mable's top Halloween costume picks! Batman is one of the original super heroes that inspired everyone to become the best version of themselves in order to help the world. And he’s a regular guy! Not a demi-god or a mutant, but a human being with a dark past and a dedication to making positive change. Now that’s a superhero for the new millennium. Batman is also one of the most portrayed super heroes on TV and movies. (Coincidence? We think not.) First the wildly popular Batman TV series in the 60′s and the first wave of Batman movies in the 90′s. 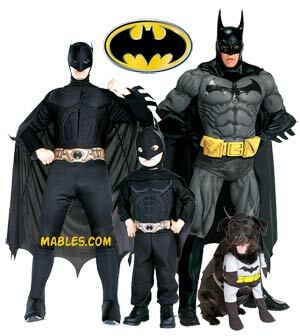 Then Batman Begins was the first in a trilogy of prequels (and a very popular Halloween costume in 2005). Christian Bale has given a new flavor to the caped crusader, making The Dark Knight and The Dark Knight Rises blockbuster successes. Kids Deluxe Batman Superhero Costume Boys Batman Costume Dc Comics Euc! High quality and comes complete with lots of details, this Batgirl costume is a customer favorite. Check out the great reviews. This fun comic version Robin costume comes with the snazzy red & green jumpsuit, attached boot tops and canary yellow belt, eyemask, and flowing cape. Here’s an easy Batman costume idea: skip the full costume and go for a simple caped, muscled-looking t-shirt instead. Great for Halloween or any day if you’re a Batman fan. Holy awesome costumes, Batman! Based on the costumes worn in the Batman & Robin movie. Improve any economy Batman costume with this great mask. Or just wear the mask while running errands and have fun with it! Be sure to check out the great customer reviews and photos.